There’s always a temptation in business to look for new ways to control costs. In welding, that temptation sometimes comes down to the supplies used, like welding wire. But while a lower cost per inch may seem like a good idea, going with a cheaper alternative can backfire. Choosing the right MIG welding wire is about much more than cost control. High-quality wire that is specified appropriately for the job at hand is more forgiving and produces better welds, even under less-than-ideal conditions. It works well even on plates that have been contaminated. It allows for greater accuracy in robotic welding operations and provides consistently good welds. The same can’t be said for low-quality wire. Take into account the true cost of welding wire and it’s easy to see why cost-cutting at this level doesn’t make a lot of sense. In most situations, only 20% of costs are related to materials and of that 20% as little as 4% can be attributed to the wire. The remaining 80% of costs come down to labor and overhead. Skimping on wire that makes up just 4% of your costs could backfire. Inferior wire just doesn’t work as well. That means you could end up spending more on additional pre- and post-weld operations to ensure the wire does what you need it to. In other words, choosing a lower quality wire could mean more money spent on cutting forming, prep work, cleaning, tacking, grinding, painting, etc…in order to create your end product. So, while you save on wire costs, you may see your already more expensive labor costs go up. By contrast, choosing high-quality wire could reduce your labor costs, which is where you’re spending the most money. There are plenty of choices when it comes to welding wire. 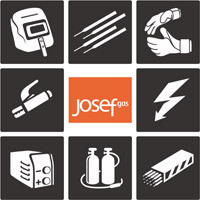 To find the best suited, most cost-effective wire for your application, contact Josef Gas. We would be happy to help you choose a wire that fits your needs and budget. Visit our Welding Equipment page to learn more about our welding wire and supplies or call us at 416.658.1212 to get advice on wire selection.